This year’s women’s basketball season brings Lipscomb fans a lot of exciting possibilities. All things considered, the 2018-19 year might also be a tough season. After finishing last year as a fourth seed that destroyed USC Upstate in the ASUN quarterfinals, the Lady Bisons will return this year with some expectations —but seven former seniors, including superstar Loren Cagle, won’t be there to help. The schedule is daunting, both in and out of the ASUN conference, featuring road matchups against teams like Clemson, Cincinnati, Belmont and Georgia, alongside home and road games against Florida Gulf Coast and Liberty. “If we continue to work hard, get better and play with a little bit of hunger and a lot of humility, then we’ve got a chance to be pretty good,” Brown said. When you look at the stats from last season, Cagle played well over 1000 minutes, converted on 192 field goals and scored 534 points. For comparison, Kmec, the team’s second-leading scorer, posted 277 points. Kmec and Rau are two key players that Brown expects the team to lean upon. Kmec is known for her three-point shot, and Rau plays with a competitive edge that is hard to match. But replacing Cagle will still be a tall task. Another intriguing player to watch is Clark, who saw extended playing time as a freshman and led the team in scoring in two games and also had the second-highest shot percentage. Look for her to step up and possibly take on a more expanded role this season. Kansas State transfer guard Anna Hammaker hasn’t seen any playing time since her freshman year due to medical and NCAA transfer reasons. But she’ll be back in action this season. “She’s quick to the rim, quick with the ball, aggressive with it, has [an] aggressive mindset,” Brown said. Her college resume includes just 26 points in 20 career games played. “I just hope she doesn’t try to get everything back in one game,” Brown said. Brown was quick to note that his incoming class has height. And if there’s anything that could help Lipscomb play more competitively against big-time teams, it could be the introduction of Gabi Grillon (6-foot-3), Kailey Rosenbaum (6-foot-1) and Taylor Hammack (6-foot). Kmec was previously the team’s tallest player at 6-foot-2. The Lady Bisons have games at Clemson, Cincinnati, Belmont and Georgia this year, making for an intriguing non-conference lineup. It will be a tall task for Lipscomb to survive in non-conference play, as the Lady Bisons lost 91-59 at home against rival Belmont last season. 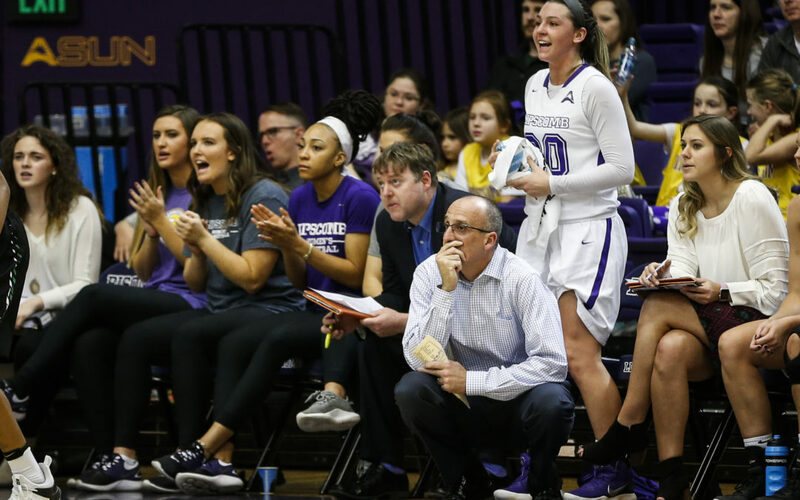 In every women’s basketball game between FGCU and Lipscomb, the Eagles have been the victor, and it would be surprising to see that streak change this season. But if Lipscomb wants a chance at the conference title, they’re going to have to figure out how to take down teams like FGCU. That was with Cagle on board, of course. The game that Brown referenced was a 68-54 loss against the Eagles, while the other two were blowouts of 36 and 50 points. The season starts Tuesday with a 5 p.m. exhibition game against Cincinnati Christian, followed by the regular-season opener versus TSU on Friday at 6:30 p.m during Homecoming Weekend. Most Lady Bisons games will be available on ESPN+ and Lumination Radio, while road games will be broadcasted on other platforms. You can track the Lady Bisons all season long here on Lumination Network.